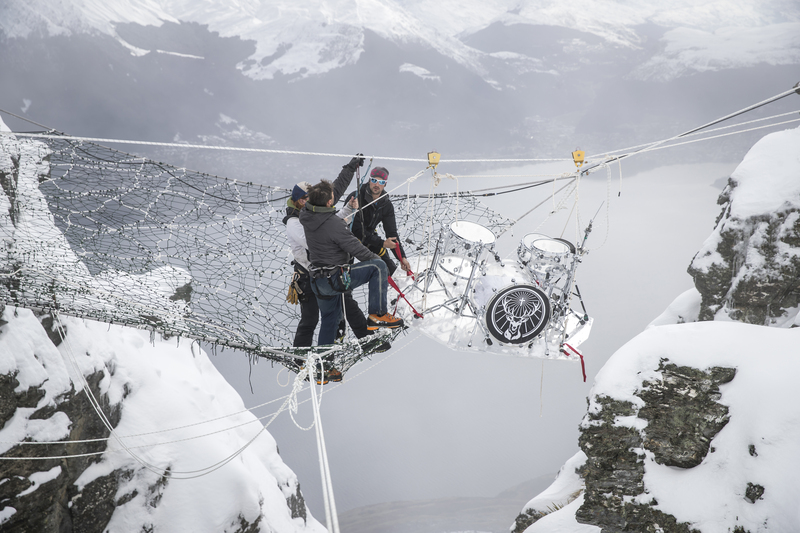 The sixth annual Jägermeister Ice Cold Gig saw Modestep perform on a space net suspended from a freezing New Zealand peak over an icy ravine. The daunting location, Cecil Peak in Queenstown, is 6,500 feet above sea level and accessible only by helicopter. 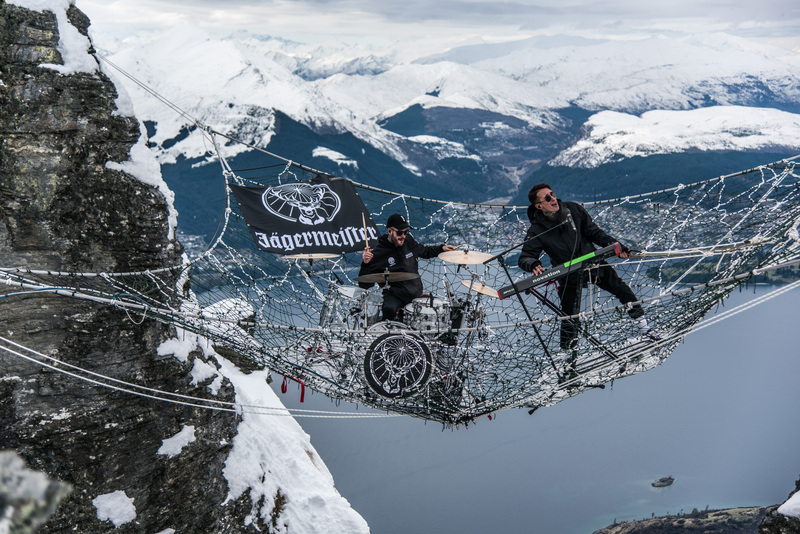 First developed for the extreme sport of base-jumping, Modestep's 'stage' was a handmade space net, made especially for Jägermeister. Rigged from the cliff edge, the space net created a unique, suspended platform on which Modestep performed. To reach their unusual stage, Josh and Pat had to zip-line over a sheer drop. What was your first impression when Jagermeister approached you for this show? "Strangely enough, I had stumbled on their previous Ice Cold Gig videos online a couple of days before. I had been thinking ‘damn this would be cool to be involved in’ and then just like magic, the email landed in my inbox. When we met up and they revealed the size of this gig, I was very excited but also low-key pooping it." How much input did you have into the process? "We’ve been involved throughout. Unlike a normal band going up there, throwing some mics on their kit and playing, we had to adapt our whole electronic live rig to work in minus temperatures and with minimal access to be able to change anything while we were up there. So technical stuff was an ongoing battle as well us as wanting to know everything just so we didn’t feel as exposed once we were up there." So did all your equipment behave ok in the cold? "Actually, one of our main MIDI cables snapped… and we didn’t have any spares. We then had to charter a helicopter to go and pick one up from the local music store. Without doubt the most expensive MIDI cable of all time!" How did you feel when you arrived at the location and saw your makeshift 'stage'? "The first time we saw it, they had built it in a warehouse for us to test out. We climbed up onto the net and then stood on our transparent plastic risers that would sit all of our gear. Within two minutes one of them snapped completely in half. It really brought the whole thing into reality, this has never been done before and there could really be some dangerous issues at play here." "Pat is actually terrified of heights, he didn’t tell us this until a couple of weeks before we left. I guess he was trying to put on a brave face? As he says, a show is a show. We didn’t have any training, everyone on the team was such a pro they just showed us what to do and when to do it. They made us feel very safe." "There was indeed a zip line that went above the whole stage. We got clipped on to it and had to shimmy our way across." Has the experience made you want to do more crazy performances like this? "It really has. The guys who did all the rigging of the net are absolute animals with this kind of extreme stuff. They became family over the week we were out there and we’re already coming up with ideas to shoot something crazy with them for a future video…"